TV manufacturer Vestel has launched what it describes as he first TVs that allow consumers to access premium pay TV services directly through their TVs without the need for a separate set-top box, Common Interface CAM or any other external device. 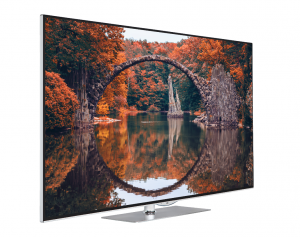 The fully integrated 43-inch UHD CASTV devices will be marketed in Croatia under the JVC brand, offering content from local Croatian digital-terrestrial pay TV operator Evotv. Vestel said the launch was enabled by its partnership with content security specialist Irdeto to implement the latter’s Cloaked CA technology that allows the secure delivery of premium content direct to Vestel’s 4K TVs. The new JVC UHD CASTVs can directly receive broadcast DVB Satellite, Cable or Terrestrial content with pay TV protection, through integrated tuners and demodulators. In the coming months, Vestel plans to release CASTVs in 49-inch and 55-inch screens as well as launching in new markets including Germany, Austria and Uzbekistan. “The launch of the JVC CASTVs addresses a market need in providing more cost-effective content delivery choices for pay TV operators while also drastically reducing subscriber acquisition costs, with no hardware subsidy required. The partnership with Irdeto has enabled this launch as Irdeto TV Cloaked CA ensures that we can give a great experience for our customers, providing easy and secure access to premium pay TV content directly through the TV,” said Hakan Kutlu, vice-president of marketing and product management, Vestel. “This partnership, and subsequent launch of JVC UHD CASTVs, is a real innovation in the industry. With no need for a separate STB or CI CAM module, consumers can have easier access to services, making new subscriber acquisition seamless for operators. All the while, Irdeto TV Cloaked CA provides premium software security to protect high value content,” said Steeve Huin, vice-president of strategic partnerships, Irdeto. “We’re focused on offering our customers a great experience in all stages of the customer lifecycle and with the JVC CASTV product, customers can easily start enjoying our DTT and OTT services immediately after product installation. The new JVC CASTVs allow consumers to watch pay TV straight out of the box and will help us to reach new customers through retail sales channels. We will continue to make our content and services as easily accessible as possible, with the highest levels of content security,” said Domagoj Frank, CEO at Evotv. Deutsche Telekom-owned Croatian telco T-Hrvatski Telekom signed an agreement to acquire HP Production, the owner of Evotv, from Hrvatska Pošta, last November. The sale is currently subject to a probe by local regulator HAKOM.